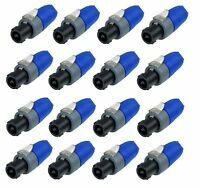 16 Pack Genuine NEUTRIK NL2FX 2 Pole Cable-end Female speakOn Connectors New!!! 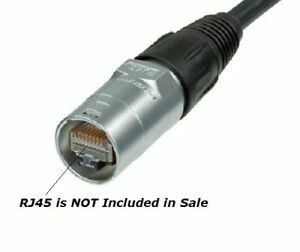 Regular cat 5/6 cables can be used where ethercon connectors are supported, but there are good reasons for taking advantage of ethercon's damage resistance and shielding. While cable strain reliefs won't install on preassembled cables, Neutrik Ethercon metal housings will click over preassembled cable connectors, perhaps after trimming boots. These connector housings strengthen cat 5 connectors similarly to an expensive VDI cable for protecting Line 6 Variax guitar connections.